Spanish authorities have filed a lawsuit against the Real Madrid superstar today. 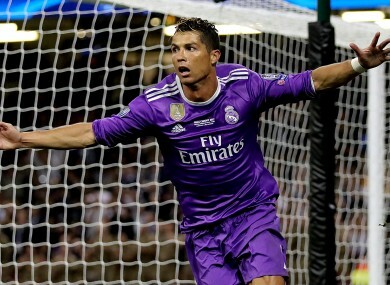 REAL MADRID STAR Real Madrid star Cristiano Ronaldo has been accused of evading €14.7 million in tax through offshore companies, the latest footballer to fall foul of fiscal authorities in Spain. The 32-year-old — the world’s highest paid athlete according to Forbes magazine — follows in the steps of Barcelona forward and Argentina star Lionel Messi, who was found guilty of the same offence last year although the sums involved were allegedly smaller. The issue of tax evasion has caused anger in a country only just emerging from a damaging economic crisis that has seen countless people lose their jobs and inequalities rise. Ronaldo is accused of “four crimes against the public treasury between 2011-14… which involves tax fraud of €14,768,897″, the office said in a statement. Prosecutors accuse the Portugal international of evading tax via a shell company based in the British Virgin Islands and another in Ireland, known for its low corporate tax rate. In addition, they say he only declared 11.5 million euros of Spanish-related income from 2011 to 2014, while what he really earned during that time was close to €43m. And finally, they accuse him of “voluntarily” refusing to include 28.4 million euros in income linked to the sale of his image rights for the 2015 to 2020 period to a Spanish company. Messi was sentenced to a 21-month jail sentence and €2.09m fine last year for tax fraud. Former Barca defender Javier Mascherano also agreed a one-year suspended sentence with authorities for tax fraud last year. Meanwhile Brazil star and Barcelona forward Neymar and his parents are due to stand trial for alleged corruption over his transfer from Santos in 2013. Email “Ronaldo accused of €14.7m tax fraud via companies based in Ireland and the British Virgin Islands”. Feedback on “Ronaldo accused of €14.7m tax fraud via companies based in Ireland and the British Virgin Islands”.